Submitted for your consideration, a very nice early Arriflex 35mm-2 or possibly an ‘2A’ version, 35mm reflex motion picture camera complete with a vintage wood tripod with factory tripod head and high hat adapter, factory eyepiece, white faced tachometer, red synthetic gate, factory original metal lens port caps, factory 400′ film magazine, factory original matte box – sunshade and a factory camera motor. These Arriflex 35 cameras were in use in the 1930s, 1940s and this version came out in the 1940s. Lenses are not included but we have a nice selection for you to consider as an accessory for your display. 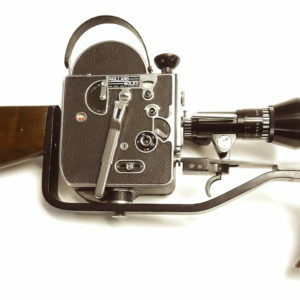 This is a German made camera that became the standard of the Motion Picture Industry Worldwide as the Mid-Century reflex viewing portable 35mm camera of choice. This camera was repainted some 25 years ago with a heavier correct style wrinkle paint finish that is thicker than the original factory wrinkle paint finish. But it is very presentable and looks pristine. 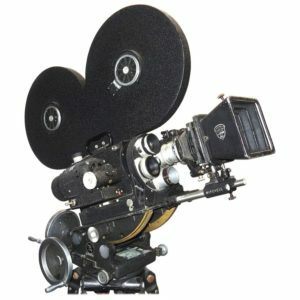 Please let us know if you have any questions on this very historical cinema camera.